The Church of the Assumption, Delvin. The site for the new Church was obtained on lease from Lord and Lady Greville on 12th February 1873. 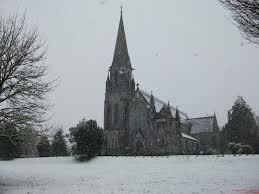 The Architect was Mr. G. C. Ashlin, who also designed Cobh Cathedral and the contractor was Mr. Davis. The foundation stone was laid on 26th October 1873 and Bishop Nulty dedicated the new Church on 2nd October 1881. Parish Records give the following account of the building of the new Church. The first step was to procure a site. An old man named Jemmy Lacy, belonging to the town, owned the field on which the Church now stands. Fr. Matthews gave him something for his goodwill and on Feb 12th, 1873 Lord and Lady Greville gave a lease for ever to Fr. Matthews and other Trustees for the site of a Church and Parochial House at a yearly rent of £4. The field contains 1 acre, 2 rood, 13 perch (Irish). Fr. Tom Burke preached in the old chapel to raise funds. 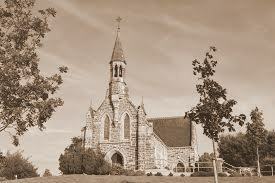 Sunday 2nd October, 1881 the new Church was blessed and opened by Dr. Nulty. The Preacher was Fr. Shinnors O.M.I. For economy the spire is said not to be the height in the original plan. Lady Greville subscribed £500. Paddy Maguire (Balrath) gave £1000 for the High Altar and other subscriptions. Out of the money he had in trust, belonging to Bernard Burke, he gave another £350 towards procuring the bell. Ashlin was Architect, Davis of Trim the builder. Davis is said to have lost heavily on account of the unexpected rise in the price of slates, but there is reason to believe that endeavoured to recoup himself by using inferior lead and a scant supply of down pipes. At any rate in 1892 the plumbing had to be done over again and a considerable addition had to be made to the piping. The new seating of the 2 side aisles, 54 seats and 2 kneelers, was done by a bequest of Brigid Quinn, Rosmead. Three others bought one seat each. James Ennis, Delvin made the seats, £7-15-0 each. Miss Quinn afterwards gave an additional £100 to complete the seats. With the completion of the new Church in Delvin in 1881 the priests and people of Delvin turned their thoughts to the replacement of the old church in Killulagh. A site was obtained from Mr Fetherstone of Rockview and Mr Ashlin was engaged as Archtect. The foundation stone was laid on 21st October 1888. It was almost complete in 1891 but because of financial constraints an altar was not provided until 1894. The Church is dedicated to St. Livinus, a local saint whose ministry is believed to date back to the time of St. Patrick. Six parish priests are known to have ministered in Delvin between 1690 and 1781. The first of these was Thomas Dease, who was succeeded by William Nugent c. 1695. His successor, Patrick Fitzsimons, was recorded as serving in 1704. He was succeeded by George Fleming. A second Fr. Nugent was his successor. He was succeeded by Patrick Ferrall, who died on 19th November, 1781 and was buried in Killulagh. 1781 – 1788 Joseph Ferrall (a brother of Fr. Patrick).